Tekashi is still behind bars and it looks like it’ll be a long time until he gets out. Prior to his imprisonment, the rapper made a few changes in his professional and personal life. The rapper broke up with his baby mama, Sara, and began dating a new woman by the name of Jade. While it’s unsure when they began dating, she’s clearly in love with the rapper to the point where she believes their love will last forever. Tekashi 6ix9ine’s girl Jade took some advice from Rick Ross and tattoed her boyfriend’s name on her so he knows its real. Jade took to social media earlier today to reveal that she got a 69 tattoo. Her new tatt mimics the prominent one on the rapper’s forehead. However, she opted to get it tattooed on her shoulder instead. It’s unsure if 6ix9ine has seen this yet, but considering his circumstances, this would likely be the highlight of his day. 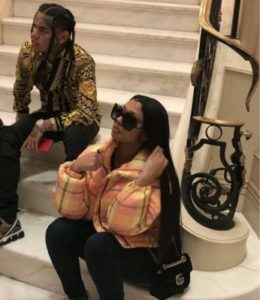 Tekashi has however has not allowed his imprisonment deter him from showing Jade love, as he got her a jewellery worth $35k as a gift on her birthday.